Check out the beauty of Nordic skiing and a Fairbanks winter night at Birch Hill. 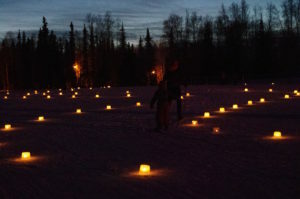 The Fairbanks community is invited to a midwinter candlelight ski. Please join us from 4-7 p.m. Friday, January 18, at Birch Hill Recreation Area. We will turn off the trail lights and instead brighten and warm the snow with hundreds of candles. This is a free event and all ages and abilities are welcome, so bring your family and friends. A beginner loop around the stadium will be available, and a special trail will be uniquely flickering. Ice candles make for a magical ski on the Birch Hill Recreation Area trails during the Goldstream Sports Candlelight Ski. Photo by Amy Kulp. Ski amidst the peaceful glow of frosted candles. Bring your own light up “bling”: glow sticks, headlamps, or light up jewelry. Take as few or as many loops as you’d like and stop inside for a warm-up and some hot chocolate and cookies. The first 80 youth skiers receive a free gift! This event is generously sponsored by Goldstream Sports and the Nordic Ski Club of Fairbanks in hopes of seeing many new faces enjoying these beautiful Fairbanks trails and to have those familiar with Birch Hill see it in a different “light.” Trax Outdoor Center, conveniently located at the bottom of Birch Hill Road, is offering 2-for-1 ski rentals for the event. After the event, guests are welcome to take ice lanterns home! Feel free to bring a sled/tote to haul these beauties away! Also, the NSCF Biathlon program will have 6 laser biathlon rifles at the Candlelight Ski for people to try out! This event had been scheduled for January 11 but was postponed due to frigid temperatures. Note: if it is colder than 10 below at 3 p.m. on event day, it may be postponed.